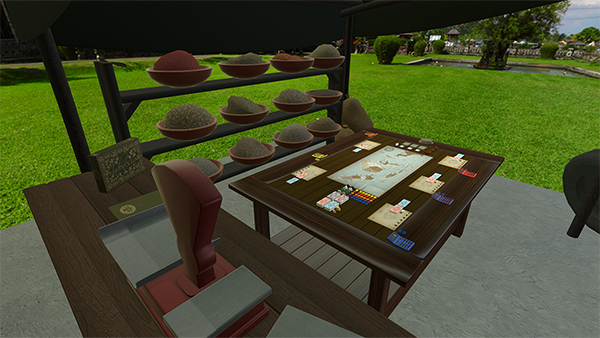 Indonesia by Splotter Spellen has arrived in Tabletop Simulator, releasing on April 14, 2017 as DLC on Steam. Indonesia is a game in which two to five players build up an economy, trying to acquire the most money. Players acquire production companies, which produce goods (rice, spices, microwaveable meals, rubber, and oil), and shipping companies, which deliver goods to cities. As cities receive goods, they grow, increasing their demands. Production companies earn money for each good delivered to a city, up to the city's capacity, but they must pay shipping companies for the distance traveled, even if they end up losing money. Players can research advantages, like greater shipping capacity or the ability to merge companies, possibly stealing ownership of lucrative plantations or shipping routes by buying out other players. Players keep their money hidden, trying to accumulate the most by the end of the third era. When only one type of a company is left, an era ends. New eras bring new cities, companies, and types of goods. At the end of the third era, the player with the most money wins. However, money earned from the last round of operations (selling/shipping goods) counts double, so it can be important to control the timing. Everyone must own Tabletop Simulator in order to play Indonesia. [UPDATE] Update v9.0 New DLC Indonesia, 64-bit, Engine Upgrade, & New Tablet Browser!